Facilitator | Naka Ima "Inside of Now"
Deborah Riverbend and Jaime Campbell are the creators of the Naka-Ima workshops. 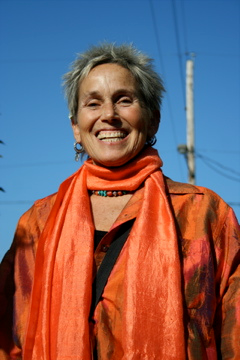 Deborah has been teaching Naka-Ima in Canada, New York, California, and Oregon since 1993. “The most prominent theme of my life has been following my spirit and excitement. This has led me to teach in New York inner city schools; create and teach in open learning environments for emotionally disturbed teenagers; live on a kibbutz; raise my son on a lesbian commune; travel extensively in SE Asia and India; hand build my adobe home; live without running water and electricity; study in a doctoral program for experimental education at Harvard University; bike ride across America; create, produce, and act in political theater; study Jewish law, tradition, and mysticism, as prescribed in the Torah, Talmud, and Kabbalah; juggle fire; undergo Jungian therapy and dream analysis; practice and create women’s culture and ritual; teach transformational and business courses while living communally with a staff of twenty; be a backyard goat and sheep farmer; win an anti-nuclear power case “pro se” in the New Hampshire Supreme Court; study Reiki; create large appliqué wall hangings; have three of my political banners travel the U.S. for a year in an art show entitled “Proclaiming Dreams of Peace and Justice”; practice meditation and yoga in an Indian ashram, at U.S. retreats, and at home; design and sew clothing professionally; work for Cesar Chavez as the New York/New Jersey organizer for the United Farm Workers grape boycott; be arrested numerous times at anti-war demonstrations; co-create with Jaime Campbell and teach Naka-Ima workshops.